Arriving on the island of St. Lucia, I was welcomed into a lush and quiet open-air reception area at Anse Chastenet. Tucked on the side of a hill, this exclusive resort is truly tropical in its design, with its rooms being open air. And soon I was taken to my room – lots of local wood furniture, accented with a colourful plaid, also a local textile. And a massive piece of art. I was told that each room had an original piece of art, done by artists who were inspired after staying at the resort. 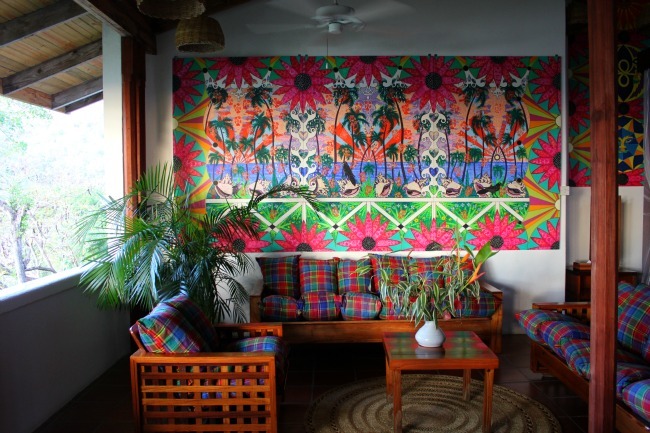 The large piece in my room was a mix of flowers and palm trees and bold shades of pink, green, orange, yellow and blue. It wasn’t quiet, contemplative or neutral, the standard for so many hotel rooms. It focused on the power of colour – that its there to evoke an emotion – and for me and many others, it brings joy. This piece of art was happy, fun, friendly and maybe even enthusiastic. And it truly represented St. Lucia and even the Caribbean – a riot of natural bright colours and a warmth that was always shared and certainly extended to any visitor. For any traveller, its about the power of positive emotions and that a smile is always welcome. Want to know about how art can teach a traveller? Gorgeous colours in that beautiful artwork!